120 by 90 by 33 in. 304.8 by 228.6 by 83.8 cm. 79 by 75 by 43 in. 200.7 by 190.5 by 109.2 cm. 43 by 22 1/2 by 25 in. 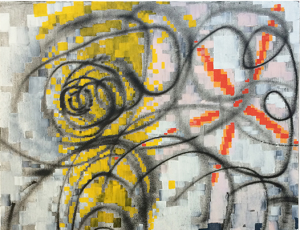 109.2 by 57.2 by 63.5 cm. 41 1/2 by 42 by 24 in. 105.4 by 106.7 by 61 cm. 94 by 26 by 24 in. 238.8 by 66 by 61 cm. 28 by 21 by 15 in. 71.1 by 53.3 by 38.1 cm. 138 by 216 by 43 in. 350.5 by 548.6 by 109.2 cm. 23 by 15 by 11 in. 58.4 by 38.1 by 27.9 cm. 14 1/2 by 12 1/2 by 1 5/8 in. 36.8 by 31.8 by 4.1 cm. 20 by 23 by 5 in. 50.8 by 58.4 by 12.7 cm. 9 by 10 1/2 by 3 in. 22.9 by 26.7 by 7.6 cm. 11 by 8 1/2 by 1 1/2 in. 27.9 by 21.6 by 3. 8 1/2 by 19 by 4 ft. 2.59 by 5.79 by 1.22 m.
Height variable, minimum: 16 by 17 by 18 ft. 488 by 518 by 549 cm. 67 by 62 by 27 in. 170.2 by 157.5 by 68.6 cm. 18 by 11 by 8 in. 45.7 by 27.9 by 20.3 cm. 31 by 42 in. 79 by 107 cm. 19 by 22 by 9 in. 48.3 by 55.9 by 22.9 cm. 18 by 16 by 4 1/2 in. 45.7 by 40.6 by 11.4 cm. 52 1/2 by 28 by 25 in. 133.4 by 71.1 by 63.5 cm. 29 by 14 by 4 in. 73.7 by 35.6 by 10.2 cm. 90 1/2 by 30 by 25 in. 229.9 by 76.2 by 63.5 cm. 29 by 27 by 8 in. 94 by 53 by 26 in. 238.8 by 134.6 by 66 cm. 93 by 51 by 22 in. 236.2 by 129.5 by 55.9 cm. 104 by 47 by 63 in. 264.2 by 119.4 by 160 cm. 114 by 108 by 84 in. 289.6 by 274.3 by 213.4 cm. 61 by 81 by 80 in. 162.6 by 205.7 by 203.2 cm. 96 by 144 by 112 in. 243.8 by 365.8 by 284.5 cm. Jessica Stockholder’s sprawling constructions have played a crucial role in expanding the dialogue between sculpture and painting and form and space. 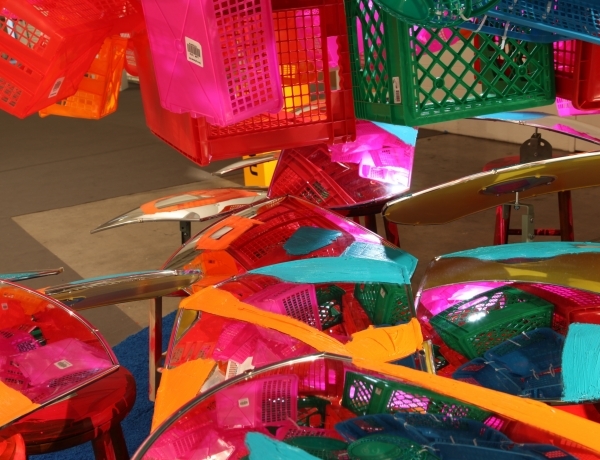 Within her work, the artist merges seemingly disparate, everyday objects to create holistic, colorful installations. Stockholder employs quotidian goods such as plastic bags and containers, extension cords, lumber, plywood, carpets and furniture, drawing attention to the aesthetic and formal qualities of these often overlooked items while avoiding overt symbolism and narrative storytelling. 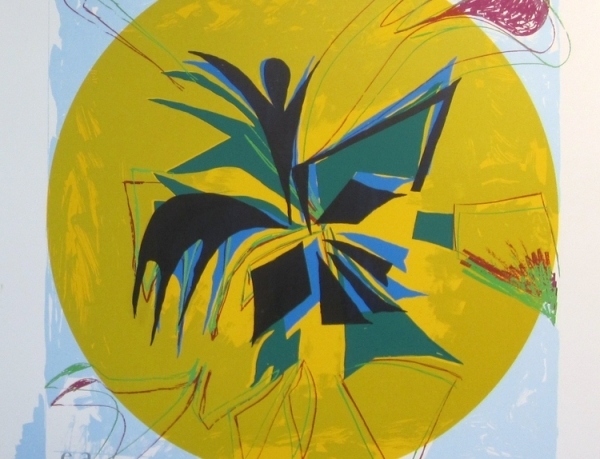 With deliberate placement and the eye of a master colorist, she maps out a constructed world informed by numerous artistic traditions, including abstract expressionism, color field painting, installation art, and minimalism. 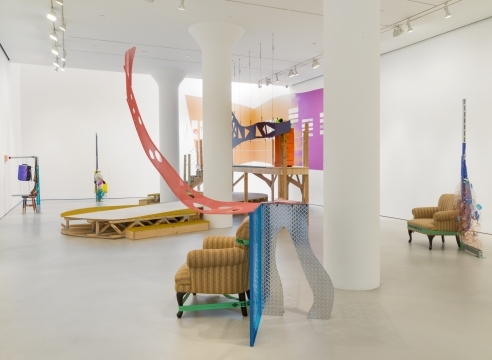 Jessica Stockholder was born in 1959 in Seattle, Washington and currently lives and works in Chicago, Illinois. She has exhibited widely in museums and galleries internationally. 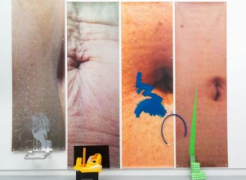 Her solo exhibitions include the Power Plant, Toronto (2000); MoMA P.S. 1, New York (2006); the Musée d’art Modern, Saint-Etienne, Métropole, France (2012). Her work is represented in the permanent collections of numerous museums including the Whitney Museum of Art, New York; The Art Institute of Chicago; MoCA LA; SF MoMA; the Museum of Fine Arts, Boston; The British Museum, London; and the Stedelijk Museum, Amsterdam. Stockholder had her third solo exhibition at Mitchell-Innes & Nash, The Guests All Crowded Into the Dining Room, in the fall of 2016 and a solo exhibition titled Relational Aesthetics at The Contemporary Austin in 2018. 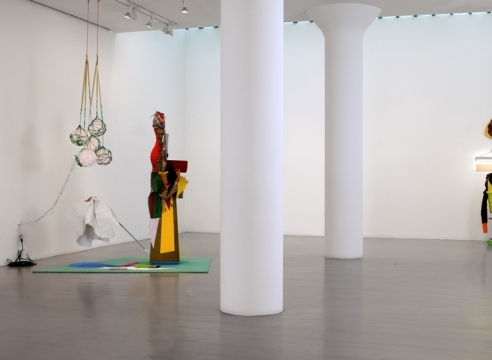 All images © Jessica Stockholder. 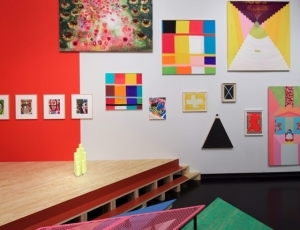 Jessica Stockholder is the subject of a solo exhibition titled Stuff Matters at the Centraal Museum in Utrecht, Netherlands. 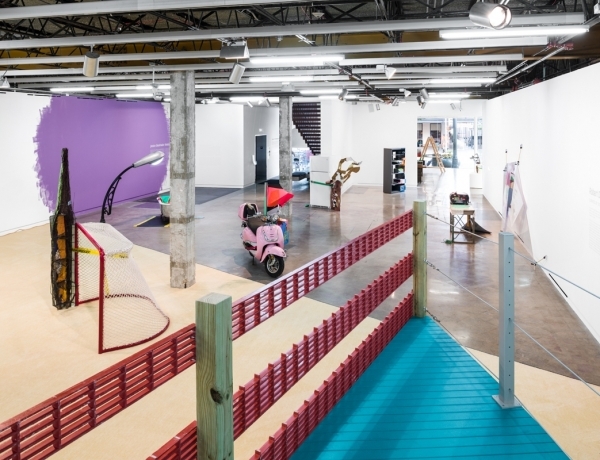 Jessica Stockholder is the subject of a solo exhibition at the Jones Center at The Austin Contemporary, organized by Associate Curator Julia V. Hendrickson. 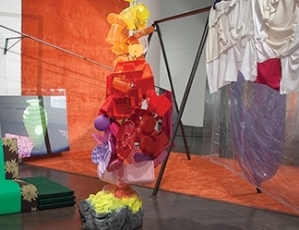 Jessica Stockholder is included in the group show The Conditions of Being Art: Pat Hearn Gallery & American Fine Arts, Co. (1983-2004) at CCS Bard. 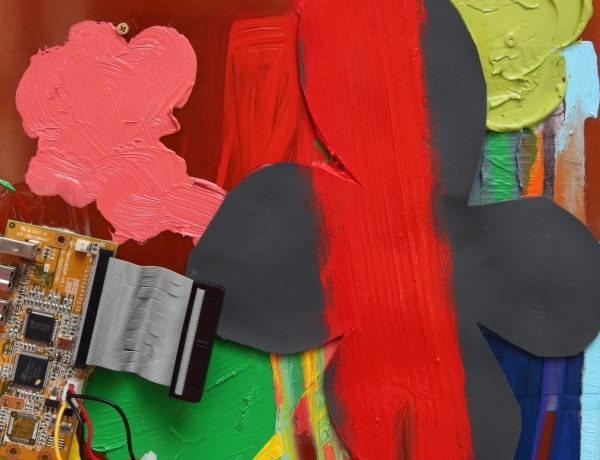 Jessica Stockholder is participating in an online postcard charity sale available through Monday, October 15, at 8 pm. Listen to Jessica Stokcholder in conversatino with Duncan Mackenzie on the podcast, Bad at Sports. 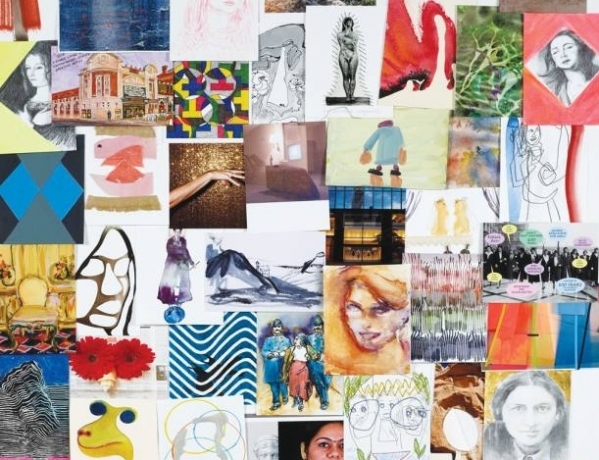 The Sammlung Goetz celebrates its 25th anniversary in 2018 with a three-part exhibition dedicated to artistic creations by women. 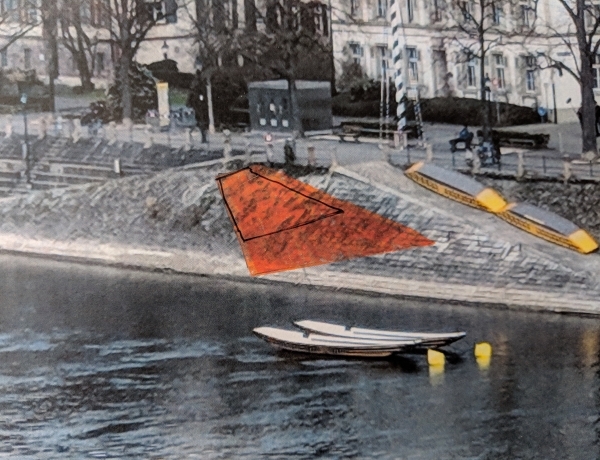 Jessica Stockholder presents a new site-specific project, Three square on the riverbank, for the 2018 iteration of Parcours for Art Basel. Jessica Stockholder is included in the Palmer Museum of Art's group exhibition Plastic Entanglements, which brings together sixty works by thirty contemporary artists to explore the environmental, aesthetic, and technological entanglements of our ongoing love affair with this paradoxical, infinitely malleable substance. Three works are installed in the library where they exist in and amongst other objects that they are similar to. Each of the works, Sorrow, Keeping Abreast, and Ceded takes as its staring point a generic desktop electronic device. 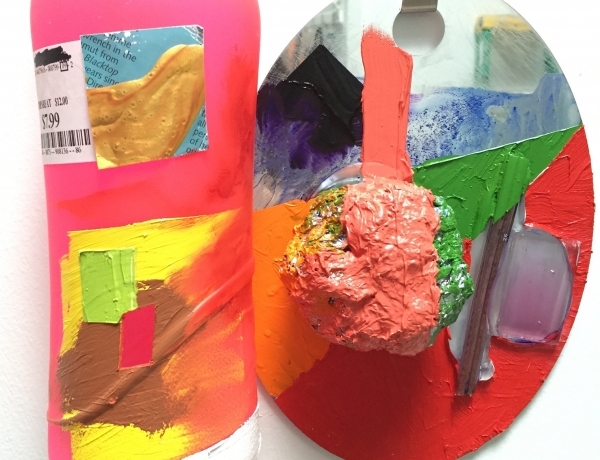 Join us at The 2018 Aldrich Benefit Bash on Saturday, April 21 from 7 to 10 pm, honoring Jessica Stockholder and chaired by Lucy Mitchell-Innes. 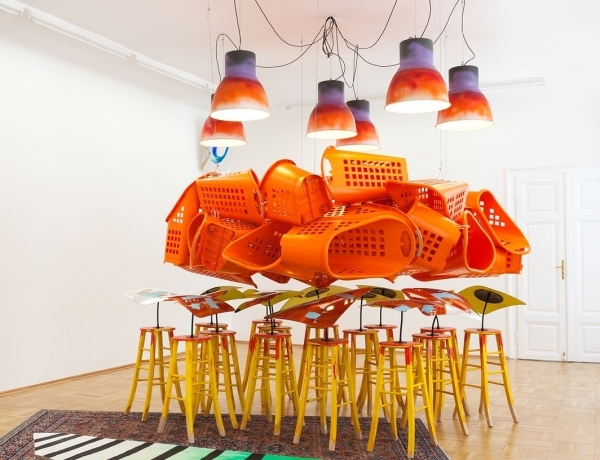 Mitchell-Innes & Nash congratulates Jessica Stockholder on her inclusion in the 2018 Class of the American Academy of Arts and Sciences. 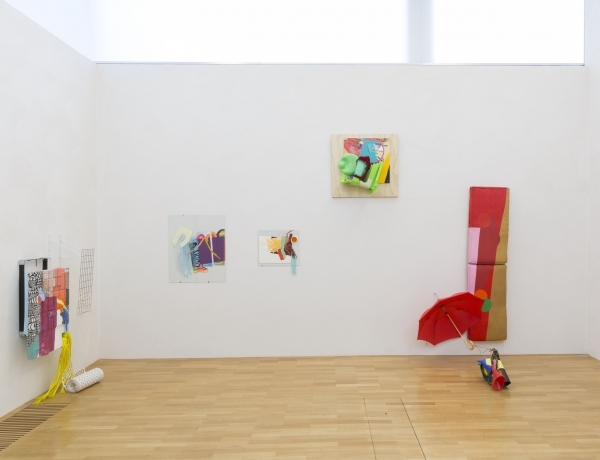 Jessica Stockholder is included in the Fine Arts Center Gallery's group exhibition Contra. 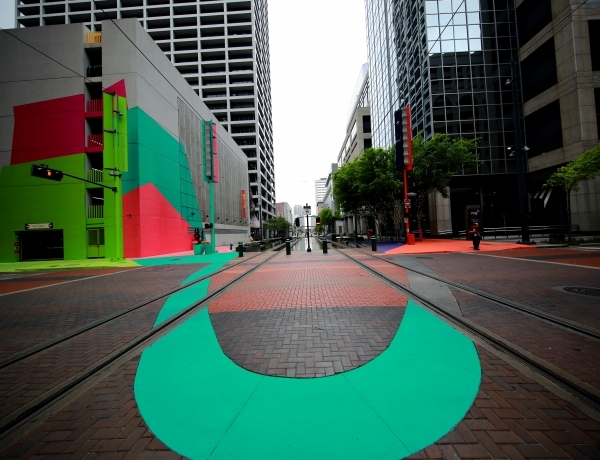 Talk by former Rice Gallery artist Jessica Stockholder, whose newest public work, Color Jam Houston, is in progress as part of Art Blocks in Main Street Square in Downtown Houston. Co-sponsored by Rice University and Blaffer Art Museum. With introductions by Rice Gallery Director Kim Davenport and Blaffer Art Museum Director Claudia Schmuckli, Stockholder will discuss her current project in conversation with past projects, including her installation at Rice Gallery in 2004, and her 2004 solo exhibition at the University of Houston Blaffer Gallery: Jessica Stockholder, Kissing the Wall: Works, 1988-2003. 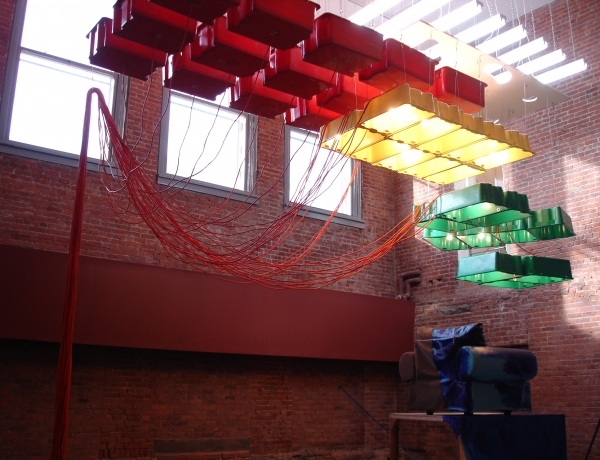 In a site-specific Threshold series installation, Jessica Stockholder transforms the Smart’s lobby with a wave of color and texture that climbs to the clerestory, cuts across the floor, and travels outwards into the Museum’s sculpture garden. 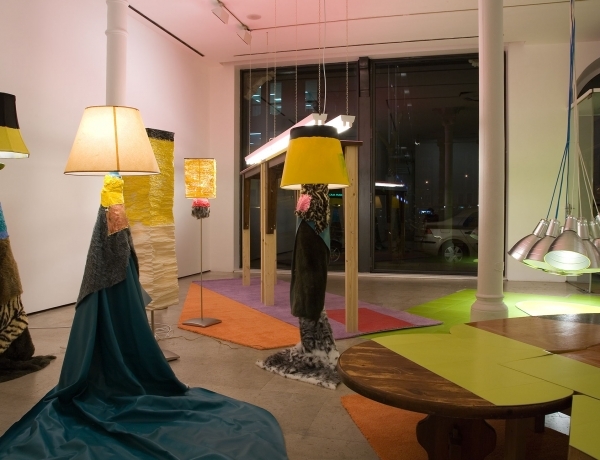 Rose’s Inclination makes use of ordinary materials—thrift store lamps, paint, Plexiglas, carpet, and even mulch—to “reach up and out” and vibrantly alter the physical experience of the Smart Museum’s modernist architecture. Capricious is pleased to announce the release of ==#2, made first available at the upcoming LA Art Book Fair, January 29th-February 1st, 2015. 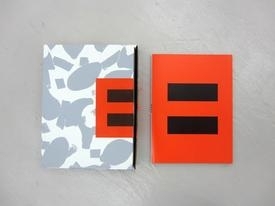 ==#2 is a non-thematic arts publication contained in a box with a 96-page bound volume featuring artist-to-artist interviews, texts, and transcriptions. Six loose multiples are also included. Gary Lichtenstein Editions at Mana presents Jessica Stockholder: trees, an exhibition featuring original silkscreen monoprints created by Stockholder and Lichtenstein as a result of their collaboration on the production of Hollow Places Court in Ash-Tree Wood for The Aldrich Contemporary Art Museum in 2011. 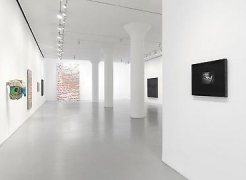 On view from September 14 to October 24, 2014, the exhibition is presented at Gary Lichtenstein Editions, on the second floor of Mana Contemporary. 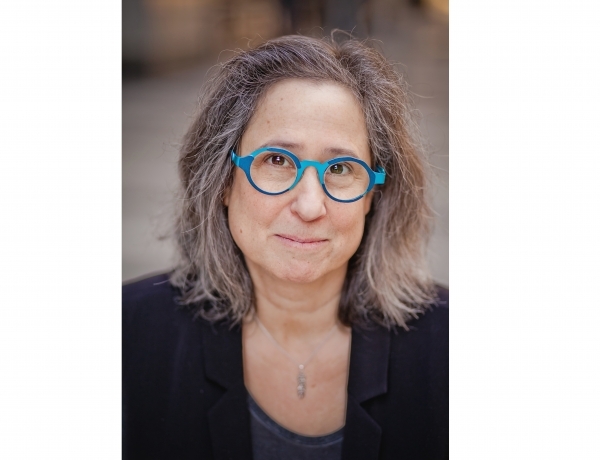 New York, March 17, 2014 — The American Academy of Arts and Letters announced today the eleven artists who will receive its 2014 awards in art. The awards will be presented in New York City in May at the Academy’s annual Ceremonial. 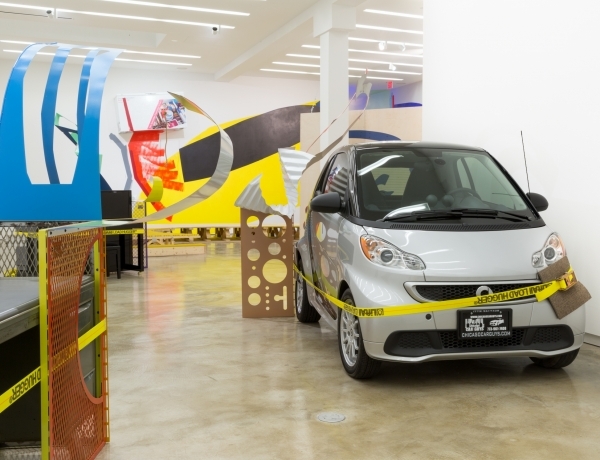 The art prizes, totaling $112,500, honor both established and emerging artists. The award winners were chosen from a group of 37 artists who had been invited to participate in the Invitational Exhibition of Visual Arts, which opened on March 6, 2014. The Exhibition continues through April 12, 2014, and features over 120 paintings, sculptures, photographs, and works on paper. The members of this year’s award committee were: Lynda Benglis, Varujan Boghosian, Eric Fischl (Chairman), Yvonne Jacquette, Catherine Murphy, Philip Pearlstein, Judy Pfaff, Paul Resika, Dorothea Rockburne, and Terry Winters. 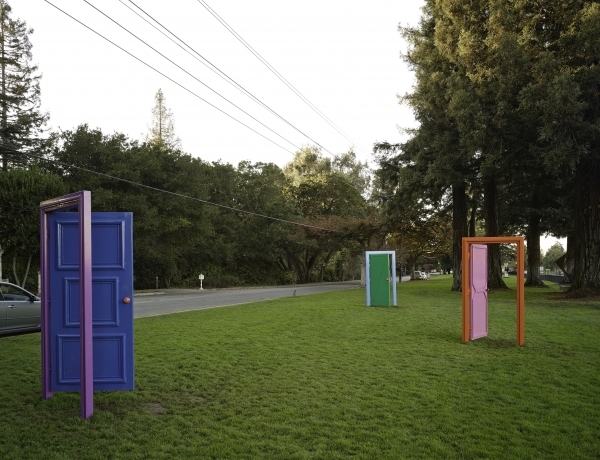 From November 9, 2013 through March 2, 2014, the San Francisco Museum of Modern Art (SFMOMA) will present Project Los Altos: SFMOMA in Silicon Valley, an exhibition sited throughout the downtown commercial core of Los Altos, a town located in the heart of Silicon Valley. Project Los Altos will be on view at indoor and outdoor locations—ranging from commercial spaces to a public intersection—and include existing artworks as well as newly commissioned, site-responsive projects. Featured artists include Jeremy Blake, Spencer Finch, Charles Garoian, Christian Jankowski, Chris Johanson, Mike Mills, Kateřina Šedá, Alec Soth, and Jessica Stockholder. 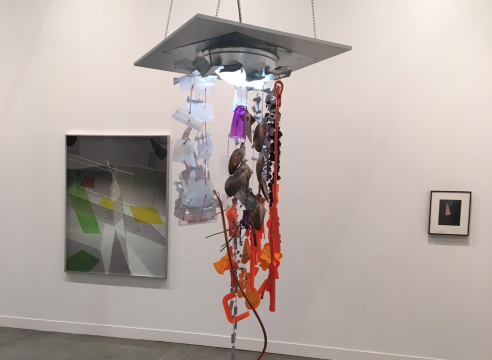 Mitchell-Innes & Nash is pleased to invite you to visit Jessica Stockholder's installation, Wide Eyes Smeared Here Dear at Art Unlimited, Booth U37. 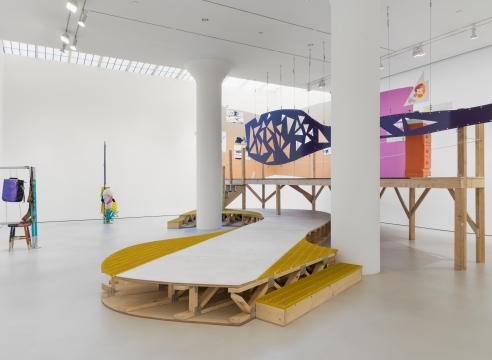 Jessica Stockholder's exhibition "Hollow Places Court in Ash-Tree Wood", initially realized at the Aldrich Museum in Ridgefield, CT, is traveling to the Ecole Nationale Superieur d'Architecture in Nantes, France. 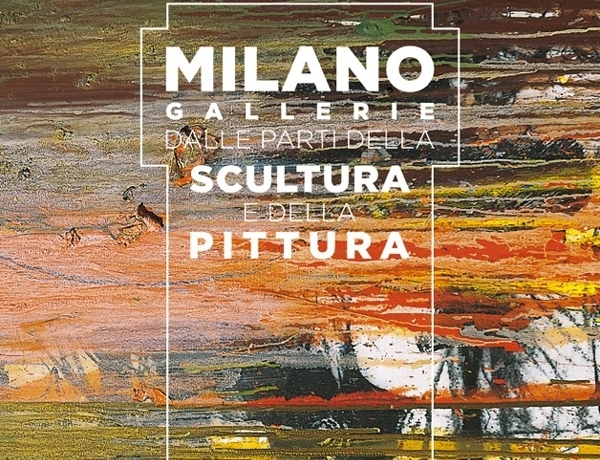 The exhibition will open on June 15th, 2012, and remain on view until September 2. For more information, please visit the website for the Frac des Pays de la Loire. 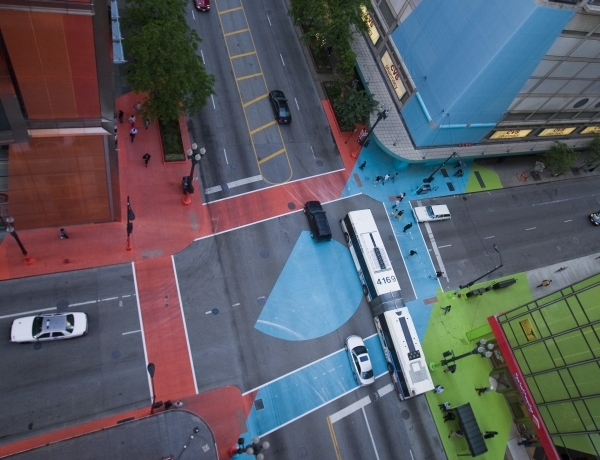 Commissioned by Chicago Loop Alliance, renowned artist Jessica Stockholder has begun saturating building façades, sidewalks, and crosswalks in bold colors in what will be the summer’s largest art installation. 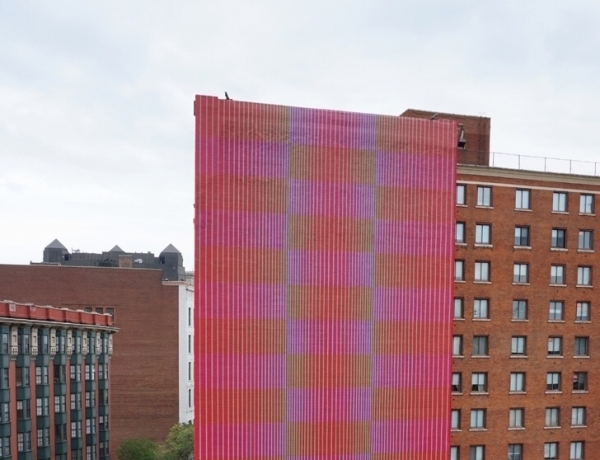 “Color Jam” – the third public artwork in the Art Loop series – is coming to the intersection of State & Adams on June 5. It will be on display through September, and will feature a series of public programs, taking the form of concerts, talks, happenings, and virtual interactions throughout the Loop. Walk a live stream of the installation site, or the "Jam Cam", from the link to the left. 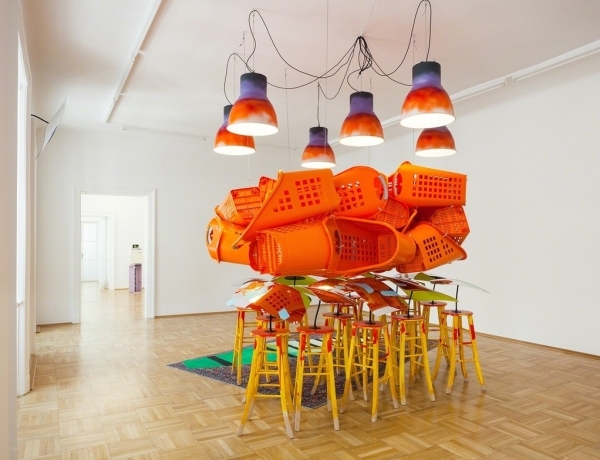 Laumeier Sculpture Park, St. Louis presents an exhibition of recent sculpture by Jessica Stockholder. 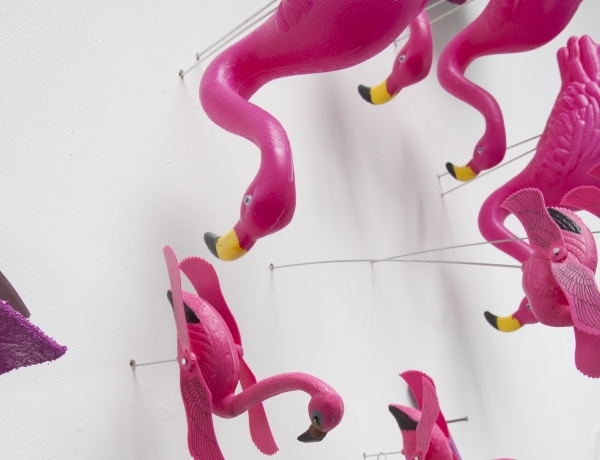 The exhibition, which opens February 12, features eleven sculptures full of quirks and unexpected materials. 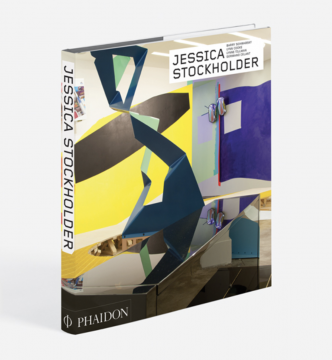 Stockholder’s work engages elements of painting, sculpture and architecture with objects more commonly found in backyards and living rooms. Her playful nature is reflected in the name of the exhibition, Grab grassy this moment your I’s. 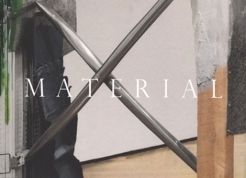 The title offers an abstract grammatical puzzle emblematic of her work that strives to change how we see common objects and materials. 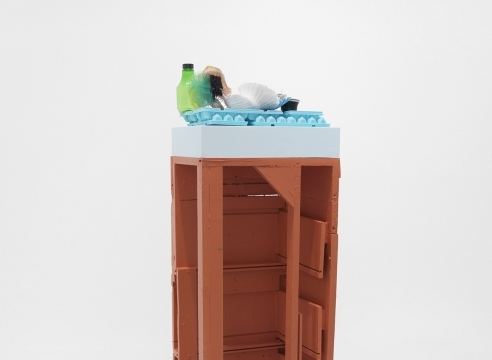 The exhibition includes Stockholder’s work, Flooded Chambers Maid, 2009-10, installed in Laumeier’s Children’s Sculpture Garden in October 2010. 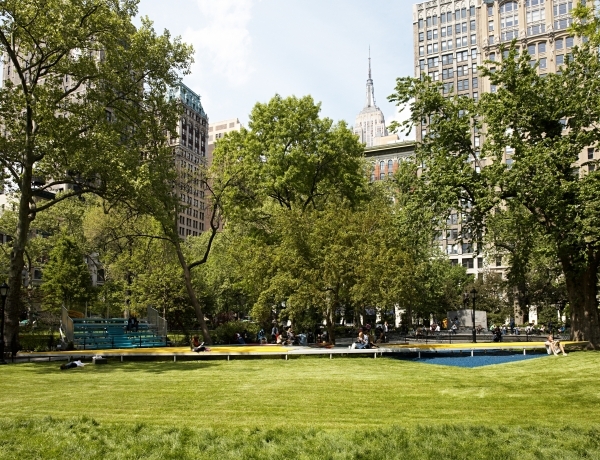 The long-term loan was commissioned by the Madison Square Park Conservancy, was previously exhibited in Manhattan’s Madison Square Park. The work will provide a platform for future performances, readings and children’s programs. 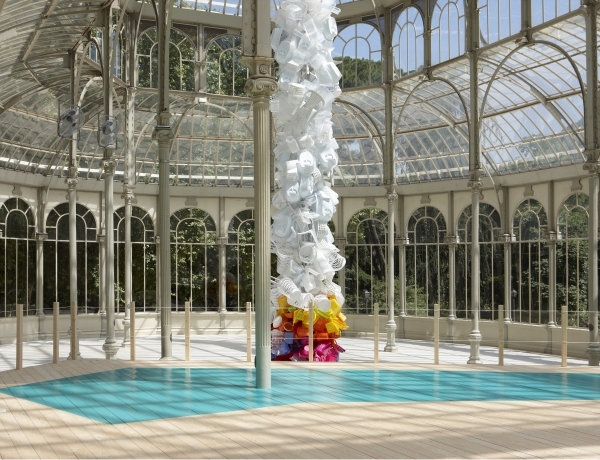 Jessica Stockholder's first museum exhibition in Spain will take open July 14 at the Palacio de Cristal of the Reina Sofia Museum. 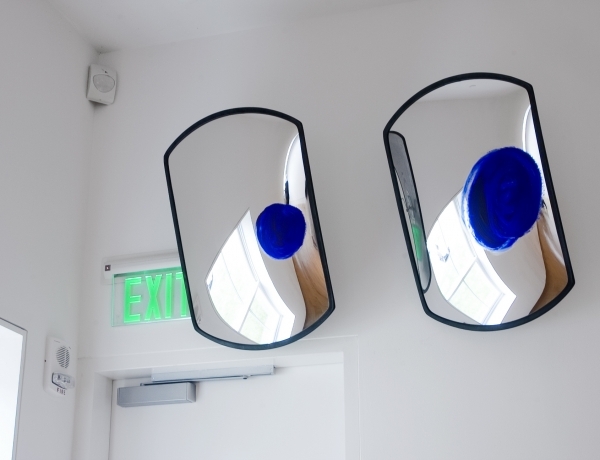 The Jewel Thief will combine works by over fifty contemporary artists with eccentric arrangements to explore new ways to think about and experience abstract art. 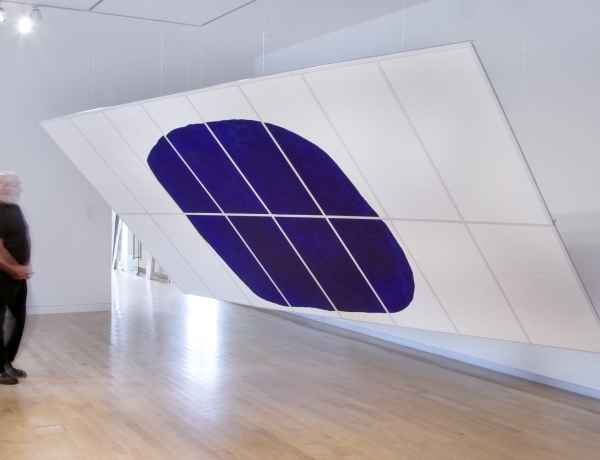 Through experiments with scale, color, material, and space, the exhibition will create an immersive environment that raises questions about art and display and enables fresh takes on the specific works. New Sparkle for an Abstract Ensemble By HOLLAND COTTER SARATOGA SPRINGS, N.Y. — In the echo chamber that is the New York art world, where one voice can give the illusion of being many, the crusading cry of late is “We need more painting!” As if there were a dearth. Is there? Walk through any of the city’s art museums, and what do see? Paintings everywhere. 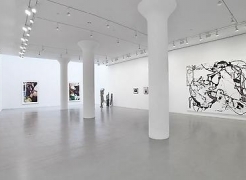 Visit contemporary galleries all over town, and what do you find? They’re painting packed. But still the cry goes on. 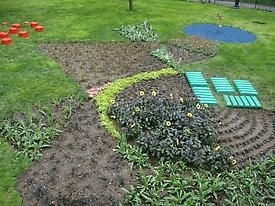 MAY 1 - AUGUST 15, 2009 The Madison Square Park Conservancy continues its 2009 season of Mad. Sq. 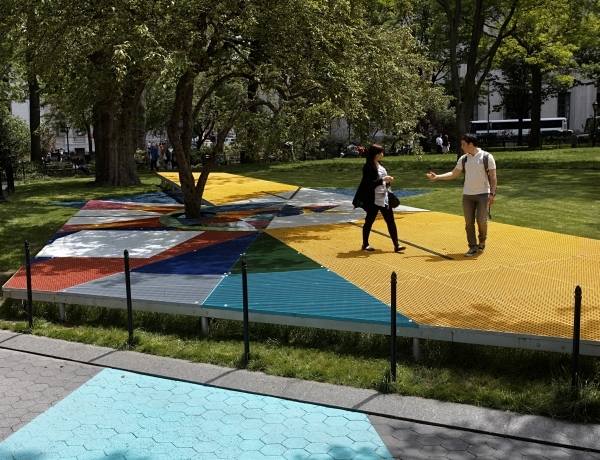 Art with Flooded Chambers Maid, a site-specific multimedia installation on and around Madison Square Park's Oval Lawn by genre-bending sculptor, painter and installation artist Jessica Stockholder. EXHIBITION PRESS RELEASE JESSICA STOCKHOLDER: OF STANDING FLOAT ROOTS IN THIN AIR February 2, 2006 through May 1, 2006 P.S.1 Opening Day Celebration: February 26, 2006 from noon to 6 (Long Island City, New York – January 20, 2006) P.S.1 Contemporary Art Center is pleased to present a new solo project by Jessica Stockholder, her second presentation at the museum. 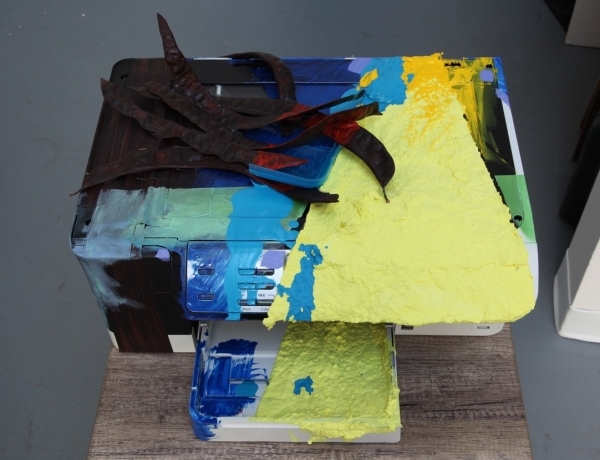 Made when she was exiting grad school at Yale in the 1980s, the painted works on paper by Jessica Stockholder in this exhibition reveal a consistency in the artist’s practice, which focuses on the engagement of architecture, color and form. Rooted in Pictorialism, a late-19th century movement that emphasized artificial pictorial qualities, the works on view were made during the same period as the celebrated artist’s outdoor installation My Father’s Backyard, a seminal piece that saw the start of Ms. Stockholder’s unique style of fusing both painting and sculpture in the same work of art. 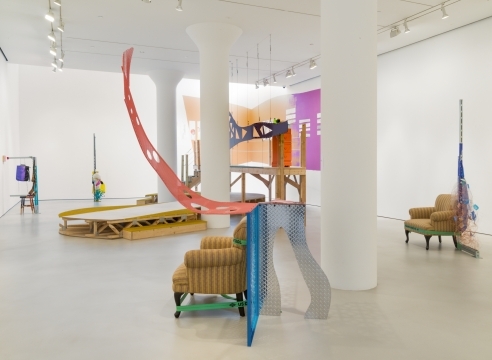 Jessica Stockholder is an artist known for breaking conventions. 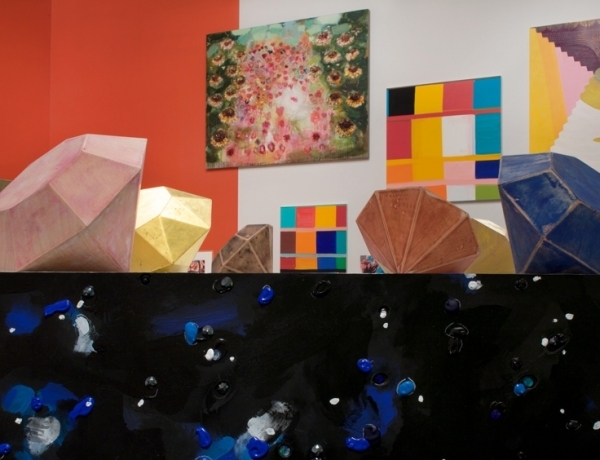 Though her sprawling artworks are often referred to as installations, she defines her manifold combinations of color and everyday materials as sculpture. Wrapped around the dark gray exterior, a triangle painted with bands of vibrant color, a log, a segment of rope, an orange electrical cord, and two large convex safety mirrors reminded me of the visual dynamics of Fiorucci, the influential Manhattan fashion boutique that closed in 1986, just a few years before I would first encounter Stockholder’s work. Thanks to Google, I soon realized that the stylistic connection I had made on site wasn’t accurate at all, so it must have been the attitude of Stockholder’s bold on-the-street statement that provoked the association. 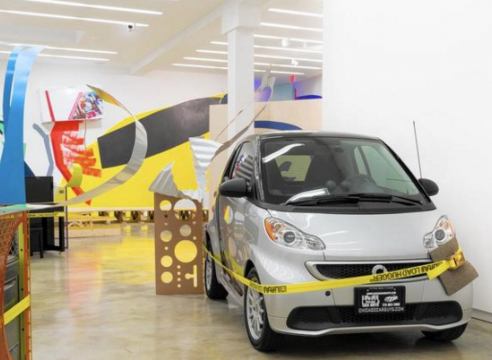 Jessica Stockholder has unveiled new work at several Chicago locations this fall, including a site-specific installation at the Smart Museum of Art as well as in her solo exhibition “Door Hinges” and the group show “Assisted". 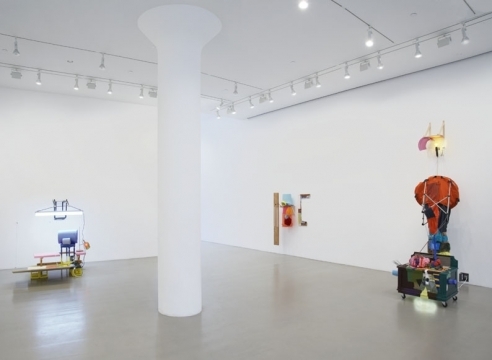 With exuberant, quirky and often kitschy creations, Jessica Stockholder has put a significant stamp on the medium of installation art. 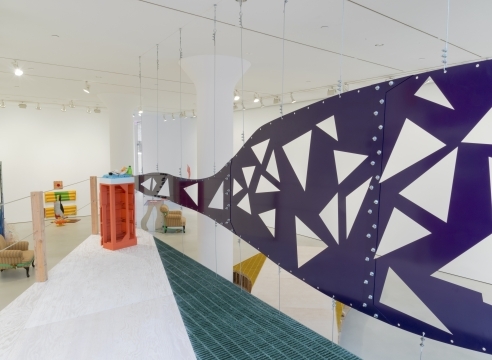 "Jessica Stockholder talks about her work, which combines painting, sculpture, installation and language in a unique creation that calls for a close personal encounter with the viewer." "Painting in Space" and "democracy in action:" it is between these two definitions, among the many possible, which can be used to describe the work of Jessica Stockholder (1959), an artist originally from Seattle, based in Chicago, who in this exhibition by Raffaella Cortese, in the space of 1 Via Stradella, presents a new collection of sculptures that showcase Stockholder's lively and formal vocabulary along with her playfully poetic elements. 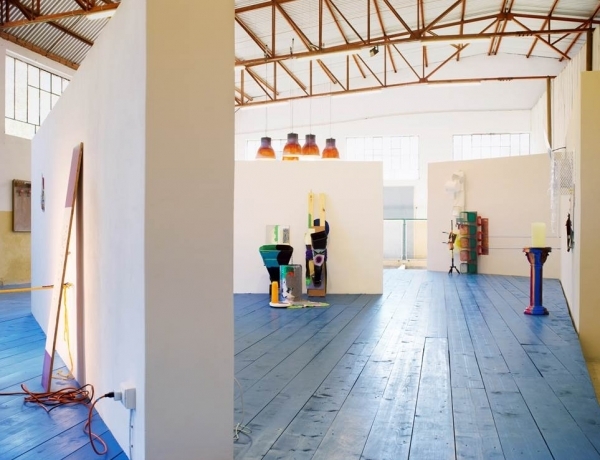 One would never suspect that Jessica Stockholder's ivy-covered studio was originally a barn. 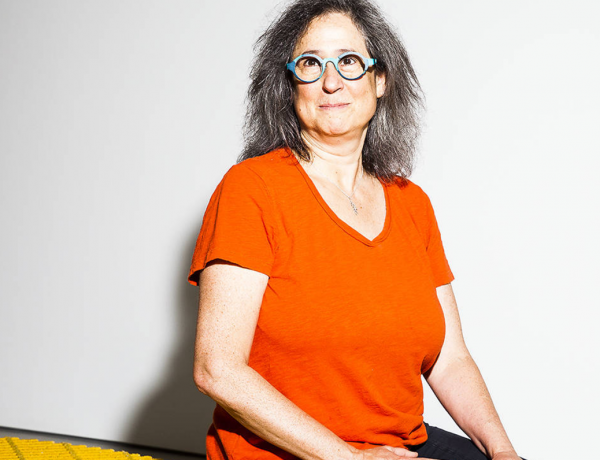 "I never stopped making paintings to start making sculptures," says Jessica Stockholder in the following interview. "What I do is both painting and sculpture." Painting is the linchpin of art history. That’s why some thrill and some bristle when artists paint outside of the lines. We expect a painting to hang flat on a wall, to have a discrete rectangular surface, usually framed. We expect a picture. That format invites a particular interaction, in which we imaginatively enter the space it offers us. 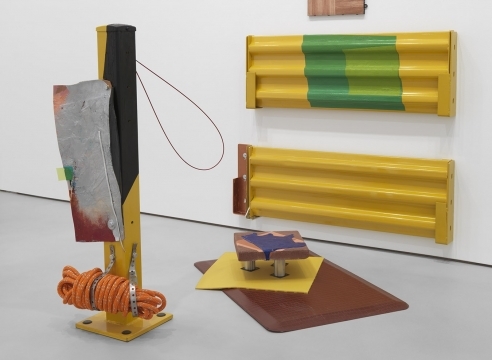 Chelsea Jessica Stockholder Stockholder was left out of "Unmonumental," at the New Museum's inaugural show of assemblage-based sculpture, but the fifty-year-old artist helped pioneer the approach, whose roots reach back through Rauschenberg's "Combines" to Dada. 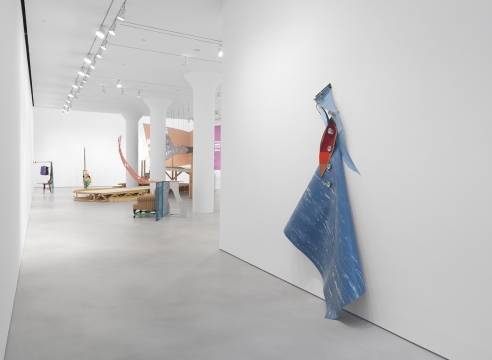 Influential collage artist Jessica Stockholder is the reigning queen of the found object -- especially shag carpet and plastics. Seven of her installations can be seen at MitchellInnes & Nash, along with, in Madison Square Park, her first U.S. outdoor installation -- a large, colorful, interactive sculptural platform that engages with nature and will appeal to children and parents alike. 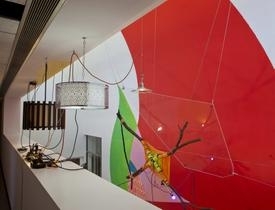 Jessica Stockholder was born in Seattle, Washington, in 1959. She studied painting at the University of British Columbia, Vancouver, and received an MFA from Yale University. Stockholder is a pioneer of multimedia genre-bending installations that have become a prominent language in contemporary art. 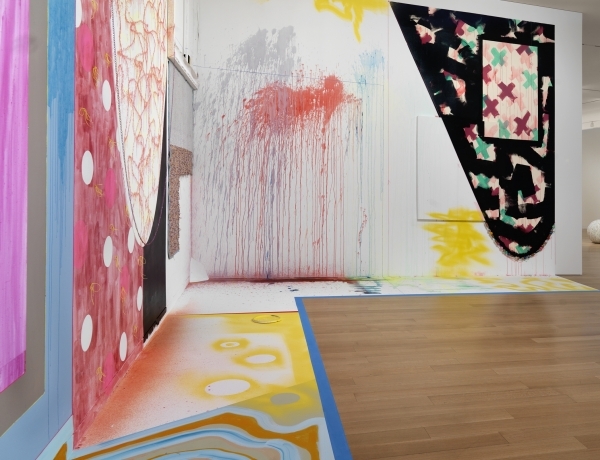 Her site-specific interventions and autonomous floor and wall pieces have been described as “paintings in space.” Stockholder’s complex installations incorporate the architecture in which they have been conceived, blanketing the floor, scaling walls and ceiling, and even spilling out of windows, through doors, and into the surrounding landscape. 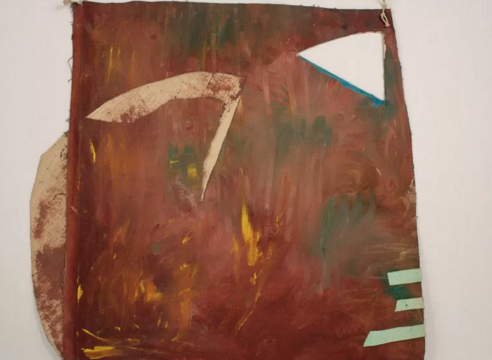 Her work is energetic, cacophonous, and idiosyncratic, but close observation reveals formal decisions about color and composition, and a tempering of chaos with control. 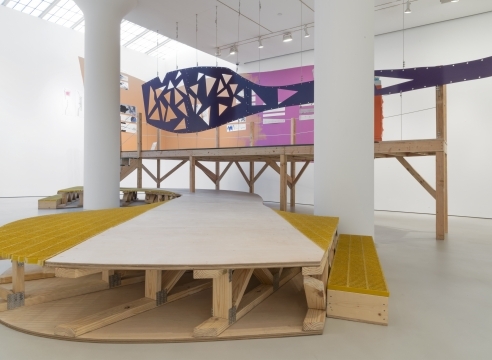 Jessica Stockholder discusses the nuanced relationship between art and landscape. 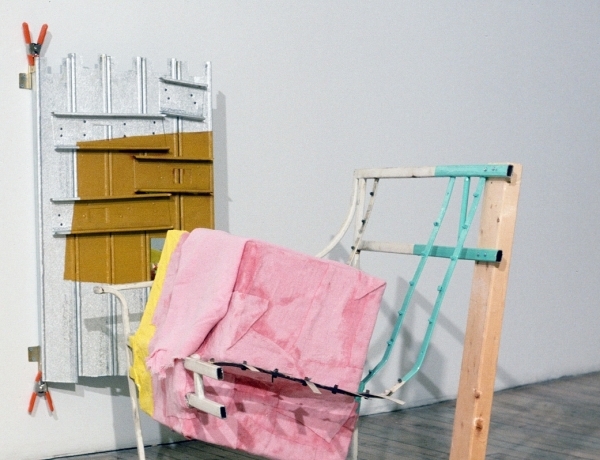 Jessica Stockholder has long been a proponent of the found object. 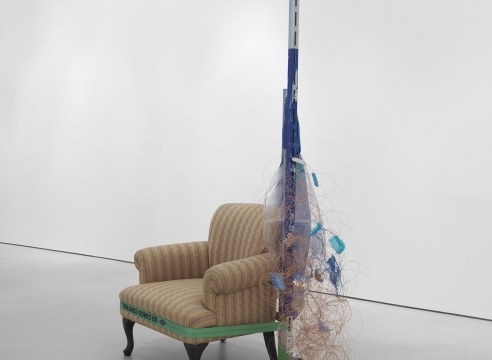 Rather than Dumpster-diving for scruffy items full of ''character'' in the Rauschenberg tradition, she favors chintzy readymades: the staples of discount stores and, more pointedly, of a consumer culture geared toward planned obsolescence. 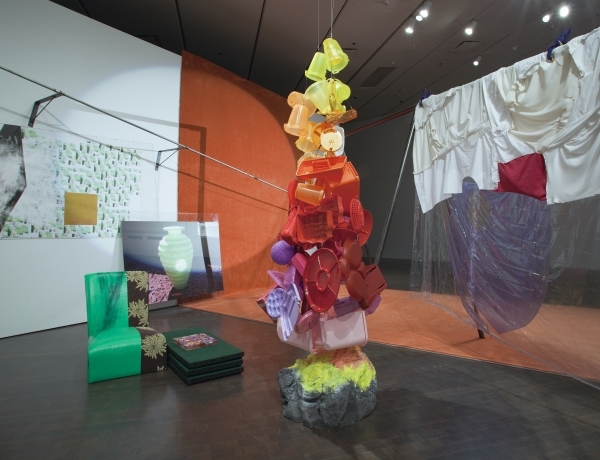 In this exhibition of works from 2006, Stockholder continues to transform commonplace objects into sculptural microcosms of saturated color and vivid form. 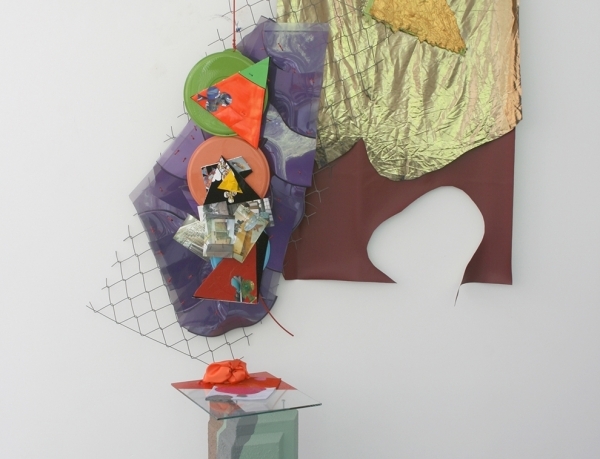 While embracing a looseness that endows her work with a sense of improvisational freedom, Stockholder does not hide the fact that there is a method to her mad, vibrant arrangements of plastic, furniture, light bulbs, or linoleum—to name only a few. Trying to come up with a taxonomy for the burgeoning idioms of contemporary sculpture is probably ill advised. But one can't help wishing for a bit of handy nomenclature to categorize the abundance of recent work in which rigorously formal propositions achieve an odd, uneasy detente with, well, junk--tchotchkes, cast-offs, discount-bin merchandise.